Candace Nicole Parker was born on 19 April 1986, in St. Louis, Missouri USA, and is a professional basketball player currently with the Los Angeles Sparks in the US Women’s National Basketball Association(WNBA). So just how rich is Candace Parker? According to sources, Candace’s net worth is estimated to be over $2 million, the main source being her career as a professional basketball player which began in 2008. Candace Parker grew up in a family that was fascinated by basketball; her father had played at college, and her older brother Anthony Parker is now a well-known former basketball player, who played for nine seasons inthe National Basketball Association(NBA). Following her brother’s footsteps, Candace Parker was determined to launch her own career. Together with her brother she studied at Naperville Central High School, where she made a name for herself, winning the Player of the Year award twice – making her the only player to receive such an honor – and even more awards and recognitions, especially when she won the Gatorade Awards and was placed alongside such famous figures as LeBron James and Marion Jones. In 2004, Candace Parker competed in a slam dunk contest hosted by McDonald’s, which she won even though she had a lot of competition from her male rivals. To add to her successful high school career, Parker was a part of a WBCA All-American honorary team, which consists of only outstanding amateur players. 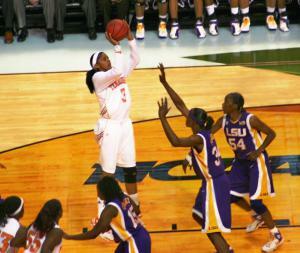 Candace Parker’s success continued at the University of Tennessee as well; during her freshmen year, Candace managed to become rookie of the year, and having secured a win for her team during the SEC Tournament Championship, became the Tournament MVP. Parker was also the only college member to participate in the FIBA World Championship for Women in 2006. Her sophomore year was marked by a huge achievement when she passeded 1,000 points in total for her career. This led her to become the SEC Player of the Year, as well as to receive the Most Outstanding Player award. After a successful Junior Year, Candace Parker was selected by the Los Angeles Sparks in the 2008 WNBA Draft – they were not disappointed with their pick, as Parker scored 34 points in her debut game and continued her successful performance, which eventually gained her the Rookie of the Month Award. For the 2008 season, Parker was named both the Rookie of the Year and the Most Valuable Player (MVP) of the Year, which made her one of the few professional basketball players to earn these two awards during the same year.Her net worth was well established. Candace Parker took a short leave from basketball in 2009 in order to give birth to and raise her daughter, but returned to lead the team to the play-offs. In 2010 a shoulder injury meant that she missed most of the season, and a knee injury in 2011 saw her miss several games, and the team missed the play-offs. The Sparks made the play-offs in 2012, and in 2013 Candace was selected for her first All-Star game, and was named WNBA All-Star MVP, as well as MVP for the season. The team made the play-offs in the following two seasons, but are yet to win a championship. Candace is currently very active in both WNBA and Non-WNBA leagues, including playing four seasons for UMMC Ekaterinburg and winning several Russian Championships and EuroLeague Championship in 2013.. Additionally, Parker played for the successful US team at the 2012 and 2016 Olympics. In her personal life, Candace Parker married basketball player Shelden Williams in 2008, and they had a daughter in 2009. 1 Daughter Lailaa Nicole (b. May 13, 2009). 2 Announced that she is expecting her first child in May 2009. [January 8, 2009].